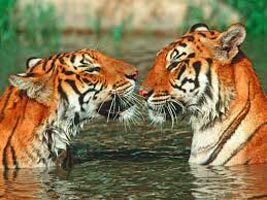 The Corbett Tiger Reserve is the best place to catch some of the best views of the magnificent predator. Summer is the best time to watch them when they flock to the water edges. Other than tigers, different species of deer can be seen in the reserve. The Sloth Bear, Himalayan Black Bear, Jackal, Indian Grey Mongoose, Common Otter, Porcupine, are the other wildlife species found in the park. An interesting way to explore the grasslands would be on the elephant, with the mahout (elephant rider) helping you explore the park to the fullest. Other than animals, there are over 580 species of birds and various reptiles, including the long-nosed crocodile, and a few species of turtles and tortoises. The Indian python and viper, along with the king cobra can also be spotted in the park. 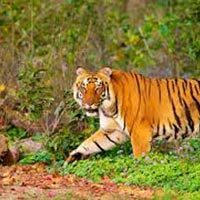 If you are looking to explore the park more conveniently, hire a jeep from Ramnagar. 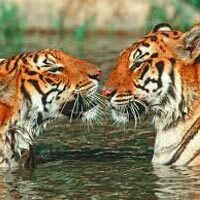 Get the services of a tour guide, who is adept at recognizing warning notes from other animals and knowing the habits of animals. You must merge as much as you can with the natural surroundings. This would include wearing earthy tones, avoiding strong perfumes, keeping noise to the minimum and disposing trash properly. Remember to carry your binoculars for that closer look! - Pick up by 3am from a common point. (Office). Max No of person, 4 per elephant. Usually a 2 hour ride. Post Elephant Safari return to the resort and check in to the rooms. Relax and post lunch- head for a guided forest and riverside tour. - Outdoor & Indoor Games like Volleyball, Soft Ball Cricket ,Table Tennis, Chess , Carrom etc. head for Jeep Safari if not done on the previous day and post which ride back home after breakfast. 7-8 hours of Drive back to Delhi. Tour Terminates by 9PM with a drop at the pickup point or Akshardham Metro Station.